There's no way that conservative Republicans in Texas could forge strong friendships with New York Democrats, right? Think again. Several members of the Texas delegation share some unexpected across-the-aisle friendships on Capitol Hill. WASHINGTON – U.S. Rep. Louie Gohmert has a peculiar ritual at the State of the Union. The Tyler Republican and conservative provocateur saves a seat each year for a progressive Democratic pal from New York City: U.S. Rep. Carolyn Maloney. In a city paralyzed by partisanship, it is difficult to overstate just how offbeat it is that these two members of Congress would want to sit together. Gohmert was the congressman who "wished to God" that the Sandy Hook Elementary principal "had had an M4 in her office" at the time of the shootings. Maloney once introduced legislation that would require gun owners to carry liability insurance. “It’s not hard to be friends with people who are honest, and she sees many important issues, to me, very differently,” Gohmert said. “But I know she wants what’s best for the country, but we just have different beliefs as to what that is." Even in the small world of Capitol Hill, members and staffers are amazed that two members of Congress who are so different could be friends. “Oh yeah. Louie Gohmert and I? We’re buddies!” Maloney said. Theirs is only one of several unexpected across-the-aisle friendships within – and among – the Texas delegation. Texas Republicans like U.S. Sen. Ted Cruz and U.S. Reps. Kay Granger and Pete Sessions also share notable friendships with New York Democratic colleagues. Fighting between Democrats and Republicans seems to escalate by the year, so it would seem bewildering that any member would greet a friend from the other party on the House or Senate floor. But in quiet ways big and small, Texas members have formed friendships with members of the opposition party that are often rooted in committee assignments and a shared passion for a particular issue. To be clear, these are not normal friendships. Members of Congress do not walk their dogs together, go to the movies or join in a round of golf on Saturdays. They are only in Washington three or four days a week and are typically overscheduled. And while politics can be an emotional drain, the setting can translate to particularly intense bonds between friends, regardless of their policy stances. "Congress can be a lonely place," said Rebecca Gale, a former Capitol Hill staffer and current Roll Call workplace advice columnist. "It's a competitive environment, you're constantly being measured by performance: elections, poll numbers, fundraising," she added. "So if you have someone who is a genuine friend, with whom you connect and see on a regular basis, you wouldn't want to let that go." 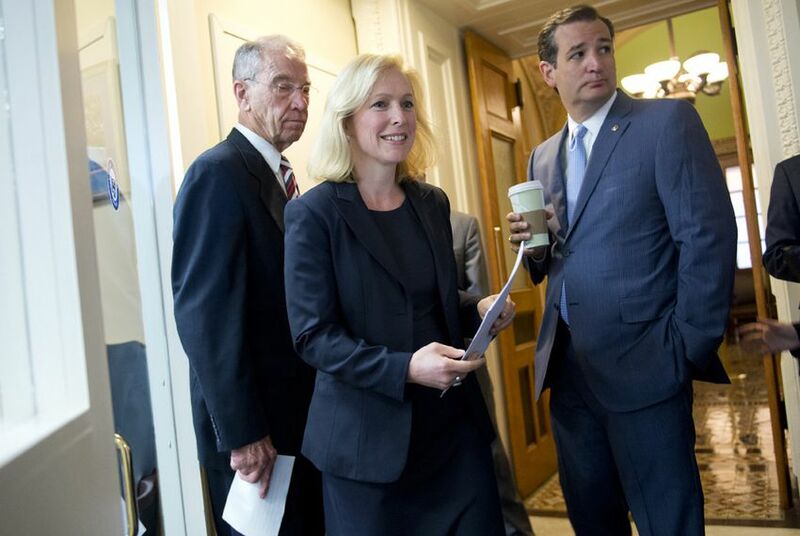 Cruz has had nothing but plaudits for U.S. Sen. Kirsten Gillibrand, D-N.Y. In his recent memoir, Cruz torched nearly every person he mentions encountering in Washington. But he devoted three pages to glowing praise of Gillibrand, calling her "determined," an "accomplished lawyer" and someone who "built a reputation for bucking the standard way of doing things." Numerous political observers have noted the friendship. “I have always been impressed with people who stand up for principle when it matters and when there’s a price to be paid,” Cruz said of Gillibrand in a June interview. Gillibrand has staked much of her legislative energy on stopping military sexual assault, something Cruz followed suit on. He cites the torture of a female relative under the Castro regime in Cuba as the root of his interest in the issue. "Pretty much any time she was doing a press conference on it, Cruz wanted to go out of his way to make sure he was there," a Cruz staffer told Tribune. "It was very important to him to be consistent in his support for the bill and to be one of the Republicans out front on it." When a Gillibrand measure fell short, Cruz wrote, "I knew she'd press on to fight the good fight again. And in time, we'll change the system." "We thought we could be a model"
Two of the best-known pals in Congress are Granger, R-Fort Worth, and yet another New York Democrat, Rep. Nita Lowey. The pair bonded over their House Appropriations subcommittee work. Depending on which party is in power, one or the other is the subcommittee chair. In an interview with the Tribune, Granger said she considered Lowey part of her innermost circle of friends, interchangeably calling her colleague “Mrs. Lowey" and "Nita." Granger's Texas twang contrasts sharply with Lowey's Bronx accent. The Democrat typically moves through the Capitol with no-nonsense purpose, indicating she has little time to stop and talk. That is, until she hears a reporter's question mentioning Granger's name — then she makes a dead stop. “For Kay? You can get me,” she said. Like Granger, Lowey emphasizes the mutual respect they share. “She’s a good friend,” Lowey said. Granger and Lowey often give speeches together about their friendship, send birthday greetings and plan international Congressional travel together. “We never plan [Congressional overseas trips] without making sure the other one can go on them,” Granger said. U.S. Rep. Ted Poe, R-Humble, bonded with former U.S. Rep. Gabrielle Giffords over border security issues before she was shot in a 2011 attack that left six people dead. Immediately after the shooting, Poe praised Giffords on the House floor and in local interviews. Border security birthed another friendship, between U.S. Rep. Henry Cuellar, D-Laredo, and House Homeland Security Committee Chairman Michael McCaul, R-Austin. A Cuellar spokesman concurred, noting that the two have visited each other's homes in Texas and the friendship extends to their wives. Gohmert and Maloney struck up their friendship while on Fox News in the days after the Giffords shooting. The State of the Union was days away, and members were in shock over the deaths and their colleague's grave injury. In a move to tone down the partisan fervor coming off the recent 2010 midterm elections, members sat with colleagues from across the aisle. "We were on a Fox TV show, going at each other," Maloney said. "And the person who was the moderator said ...'Who are you gonna sit with?' So I said, 'Louie, why don't we sit together?'" Plenty of similarly strange pairings emerged that week, but the practice faded away over the years. Not so for Maloney and Gohmert. "We sat together and had such a good time talking that we've sat together at every State of the Union since." Maloney said they even intend to co-host a Washington barbecue featuring Gohmert’s spare ribs and her hometown's staple, Nathan’s hot dogs. In addition to Maloney, Gohmert pointed to freshman Michigan Democratic Rep. Debbie Dingell as a friend, citing their work together on the House Natural Resources Committee. Mere location can often prove serendipitous in sparking unlikely friendships among members of Congress. U.S. Rep. Lloyd Doggett, D-Austin, said that when Republican former U.S. Rep. Ron Paul was serving in Washington, their offices were near each other, and they struck up a friendship on their walks from the House office building to the U.S. Capitol. Many friendships on the Hill are formed on the twice-a-day 10-minute walks to vote on the House floor. Sessions, R-Dallas, similarly struck up a friendship with U.S. Rep. Gregory Meeks, another New York Democrat, because of the proximity of their offices. Maloney counts Sessions as another friend, and the pair worked together on breast cancer legislation. When Sessions had a primary rival in 2014, the Daily Beast noted that Meeks jokingly threatened to endorse him or run against him, "whatever helps." But fraternizing with the "enemy" is still a touchy subject for many in Congress. Most of these friendships are between incumbents who are so well situated with the bases of their respective parties they do not fear serious primary challenges. Other Republican members in the Texas delegation weren't as eager to discuss Democratic friends for fear those friendships would be used against them in primaries. Some worried that naming friends across the aisle could hurt a pal's political standing. Doggett similarly declined to name conservative friends with whom he shares common ground on national security and trade issues, fearing that his liberal bonafides could hurt them politically. In such a toxic political environment, it is not hard to imagine how befriending a high-profile member of the other party could wind up in a primary campaign television ad. Granger wasn't so worried, but conceded she is on the receiving end of playful teasing for her friendship with Lowey.